Last week’s “The Bachelor” episode left viewers glued until the very last frame which read “To Be Continued” right after Colton Underwood reminded everyone of his very pro athletic background when he jumped over an 8-foot fence in the aftermath of Cassie being the fourth woman to leave on her own. She happened to be THE ONE he fell in love with and intending on proposing to. Yeah, that’ll make you want to jump a fence! This week’s show featured a live studio-audience companion show to run along side part one of this season finale with host Chris Harrison who opened it with a narration of a play-by-play season recap. After that was over, the moment millions had been waiting for. What happened after Colton jumped over that fence? Even after Harrison broke-out into a sprint down the road, Colton was nowhere to be found. He, along with producers piled into a van in the search to find Colton, who ended-up being miles down the street walking in a heated rage. It was not a happy reunion as Colton kept walking and pushed producers away. Once Colton stopped for Harrison, he revealed that he feels he’s “not enough” and “rejected” again after Cassie told him “I love you,” but “goodbye.” He had made-up his mind to be done with the whole show at that point. In the live studio, Harrison said this experience is something that he doesn’t want to ever go through again. The next morning Harrison had a sit-down with Colton who poured his heart-out. Colton said he feels like “life without Cassie wouldn’t be complete. I feel that Cassie completes me.” He said he made the mistake in the past where he didn’t fight for the girl he loved. This time, he’s going to fight for her. The finale show had the women who got their hearts broken by Colton come to the studio audience taping to talk to Harrison, and confront Colton for the first time since their breakups. The live taping followed-up after each girl’s breakup was aired. In his car ride to (apparently) Tayshia’s, Colton said after Cassie left, he feels the lonliest that he’s ever felt. Then he got Tayshia to come outside in order to call it off with her. 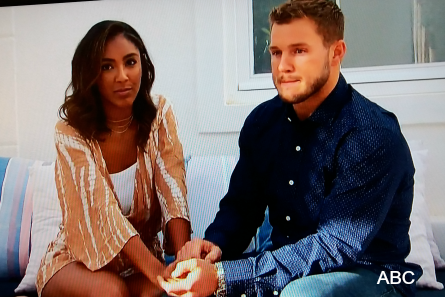 Tayshia asked to go inside and talk to Colton off-camera, which they did. However, they still had their microphones on. So, all the show picked-up was the front door along with their audio. The break-up was extendend and full of tears, more from Colton than Tayshia. He told her that he’s in love with Cassie. Tayshia joined Chris Harrison in the studio audience. She called it a “surprise” and wasn’t ready for her journey to end and was in love with Colton, who arrived to the stage to sit-down and talk to her. Tayshia asked Colton what was missing in their relationship. He said he tried to be true to his feelings and remained as open in other relationships for as long as he could. It came down to where he said his heart was closed-off and was completely Cassie’s. She thanked Colton for giving her closure as well as making her a better woman. Tayshia said she’s ready for the amazing relationship that she knows is yet to come to her. Pictured (l-r): Colton, Hannah G./ ABC Television Network Copyright. Pictured: Hannah G. with Colton Underwood / ABC Television Network Copyright. 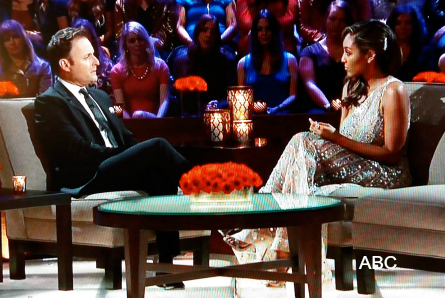 When Hannah G. joined Chris Harrison in the live studio, she said she was so blind-sided and to see his reaction that he was struggling. “It doesn’t really help that he was fliping the page.” When he showed-up, Hannah G thought she was the last girl. She didn’t know that he had been on other dates. Hannah G. said watching it all back makes her even more confused than when she had to live through it. She said she’s had to go through countless encounters with strangers asking her to see the engagement ring. Hannah G. was convinced that it was just going to be her and Colton at the end. Hannah G. said the show has been so real and “this is my reality right now” as she prepared to see Colton again. She said she was in love with him. But, now, “I know what love is and it has to be a two-way street.” Once Colton arrived to the stage and sat-down with Hannah G., she asked why he didn’t give her the same chance that he gave everyone else. Colton answered that it was the realization that he gave all of himself when he was with Cassie, and couldn’t treat Hannah G. as a “backup plan.” Hannah G. still had a lot of “what ifs.” She asked him if they had more time, would it have been a different situation between them? 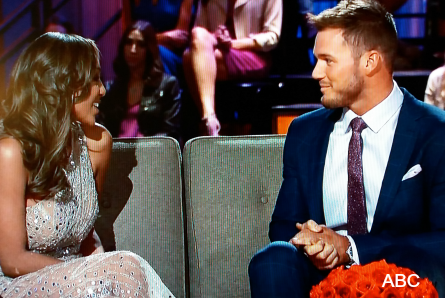 Colton answered that even watching previous ‘Bachelor show seasons, he got caught-up in the format, “but this is our lives.” He said how he was feeling that time was “stronger” and he didn’t want to beat around the bush. 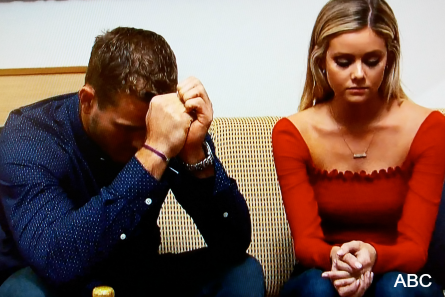 Harrison asked if Colton considered having that overnight date with Hannah G. Colton responded “no” and his emotions were everywhere once he decided that he wanted to quit the show. Previous contestants from the ‘Bachelor show franchise joined Harrison to give their thoughts, prospectives and insight into what they think Colton’s next move will, and should be. Blake said no one has shown their love like Colton did by jumping the fence. Garrett said Colton is going after what he wants and going after Cassie to get her. Jason said Colton will not be able to “move-on” until he gets that closure with Cassie. Garrett advised that Colton should listen to Cassie and it has to be a mutual thing. Cassie is shown packing-up her belongings in her hotel in Portugal. She said, “I can’t be the girl that takes something really special for him away.” Cassie said she can’t wait to go back home to be with friends and family and to move on with her life. Meantime, Colton is pinning over Cassie, and said he has to do what feels right and what feels best for him. “I came here for love and I know what I need to do.” He said “love is not simple. Love is messy.” Colton yearns to be loved back the way he loves someone. He said because of his lack for fighting for his past relationships, that was a mistake, and he’s doing that now with Cassie. This teaser ended with Colton knocking on Cassie’s hotel room door. To Be Continued – Part 2 of “The Bachelor” season 23 finale airs Tuesday night at 8 pm EST on ABC Television Network.